KEY VERSES: (1, 2, 5, 6): How long, O Lord? Will you forget me forever? How long will you hide your face from me? How long must I bear pain in my soul, and have sorrow in my heart all day long? How long shall my enemy be exalted over me? When a poor person says, “I’m broke,” it’s not just a lack-of-money-thing. The poor person tends to be “broke” in countless ways. One day while riding my motorbike on Belize’s Western Highway, I happened upon a Mayan friend of mine named Chanzy. His car was parked on the side of the road and he had his legs outstretched on the gravel, with his back leaning against a back tire. He had his cap covering his face because he was crying like a baby, and crying hard. Once he’d composed himself, Chanzy explained that he’d saved his hard-earned cash to buy the car for $600 U.S. while plopping down another $200 for repairs to get it running. It ran for a couple of days before it broke down and reduced Chanzy to tears on the side of the road where I found him. His Greatness Bob Dylan wrote and recorded a song called “Everything is Broken”—a song that, to my way of thinking, is all about the brokenness that comes with being poor. In poverty, everything breaks down—everything from people’s hearts, minds, bodies and spirits to the cars they drive and the beds that they sleep in (assuming that a poor person has a car to drive or a bed for rest at all). 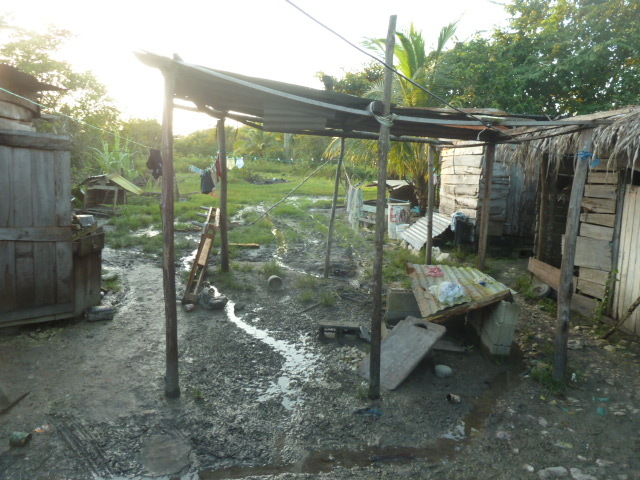 Honestly, I can say from living in solidarity with the poor in Belize that many days I look around in the neighborhoods and villages and see so much brokenness that I wonder if anything in this country ever works or keeps working, other than operations at the high-dollar resorts and casinos. Even with the frequent blackouts where I live here in San Ignacio, the one place in town where the electricity never, ever stops working is at the casino at the luxurious San Ignacio Resort. Even the generator at the hospital has been known to fail when the power fails. But the flashy, seductive lights at the casino are flashing all hours, non-stop, enticing the poor as well as the rich and well-to-do to come in and take a chance. The only thing that never breaks down–not completely–in my friend Chanzy’s life is his faith. After I gave him a ride after his brief but intense breakdown and his lamenting of the brokenness of everything in Belize, I offered to pray with him. His face lit up as he removed his cap and reached out and gripped my hand. When I finished praying and said my “amen,” he immediately started praying for me. Psalm 13 is one of the many “lament Psalms” in which a Psalmist feels so broken down that he feels he can’t go on. In his anger or frustration, the Psalmist cries out to a God who can feel as far away as a planet in a universe yet to be discovered. But always the Psalmist comes back around, at the end of his Psalm, to express trust in the goodness of the Lord, as Chanzy, God bless him, came back to his faith that day in our encounter. The poor have precious little, and yet much to teach us about faith. That we should all have as much faith as Chanzy. Or even 1/10 as much. The world is full of remarkable people who will never make the cover of a magazine or be celebrated in Hollywood, yet have so much more to offer those of us who take the time to notice.